The Dow Jones Industrial Average made a new recovery high today. In doing so it filled the down gap left open from the decline on February 2, 2018 from February 1 at the 26,187 level. This affected neither our count on the Dow (see the second chart in this previous post HERE) or the count on the S&P500. Stocks, as measured by the S&P500 Index, however, did not make a new high. They had closed yesterday at 2,889, and gapped up to 2,897 (+8 points) on the open. They traded higher to 2,907 until approximately 10 AM. At that point, the .b wave hit the 78.6% Fibonacci retracement level of the .a down wave. Prices stalled there, and traded down to the 2,896 level (down about -11 points) until about 11:30 am ET. Prices then spiked higher into the noon hour, but could not make a new high. Prices then went range-bound for much of the afternoon, trading between 2,900 and 2,906 making an apparent regular contracting triangle for most of the afternoon. As of the end of the cash session, there was a rally attempt, but neither the Dow nor the S&P could make a further high. It could be the triangle has not finished yet. So, far, the .b wave has a fairly typical 78.6% retrace on it's .a wave, and a few more points are possible. 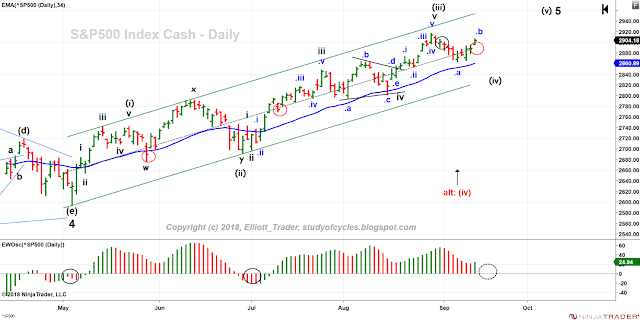 However, price action was very, very choppy today, and the potential triangle could indicate "last wave in the series dead ahead" (not trading or investment advice). For those interested, by comparison the $RUT futures have only a 50% retrace on their down wave. While price closed one gap today - see the black circle below (iii) - it opened another gap to do it. See the latest red circle. Stock exchange volume continued as moderately light with only 3.2 billion shares traded on the NYSE. The Elliott Wave Oscillator turned green, as it rose today. Price is over the mid-line of the channel which is somewhat positive for prices.